Batelco, Bahrain’s leading digital solutions provider, has announced an exclusive partnership with Talabat to reward its customers the opportunity to win an amazing array of high-value prizes. 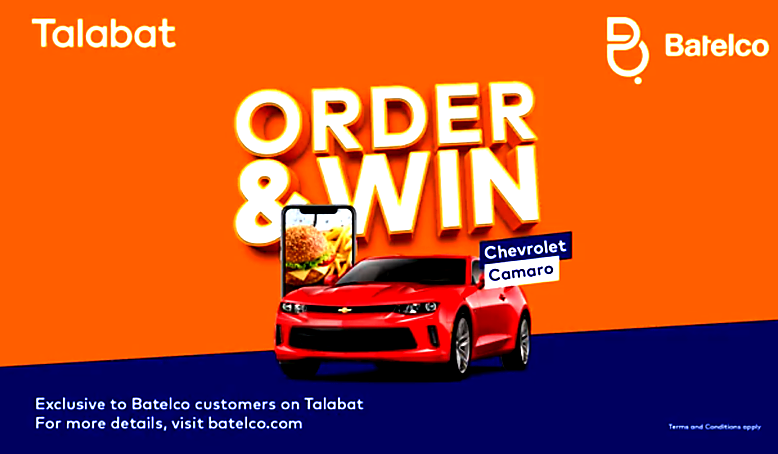 Batelco customers using the Talabat application to place their home delivery orders are automatically entered into weekly and monthly raffles which will continue until August 25. The weekly prizes provided by Talabat include an additional 200GB on Batelco Home Internet lines, two iPhone X, two iPad Pros, two PlayStation 4s, two Samsung Galaxy VRs, TCL LED TV 40” and two Sony Bravia Smart TVs 55”. The grand prizes for the monthly draws include two Chevrolet Camaros. New customers are welcome to subscribe to Batelco mobile postpaid packages to benefit from this great prize-winning opportunity with Talabat.